To start creating a Device, click on + (Add New). Each Device should be configured as an Element in SIL Comp before any Device details can be added (Refer to Configuring Elements page for more details). Pick required Element from Element Selection table of click Add Element to configure a new Element. The Device Details are shown for the selected Element. The required Dangerous Failure Mode should be selected. The Device Hours can be customised by entering a particular number of hours for a device or by entering in the installation date of that device. Note: A decommissioning date should only be entered if the device is no longer installed, not in use or has been changed. The Devices hours still contribute to the populations hours as do its Failures and Demands. A custom Demand Rate is to only be used if SIL Comp® has not been used for SIL Determination. 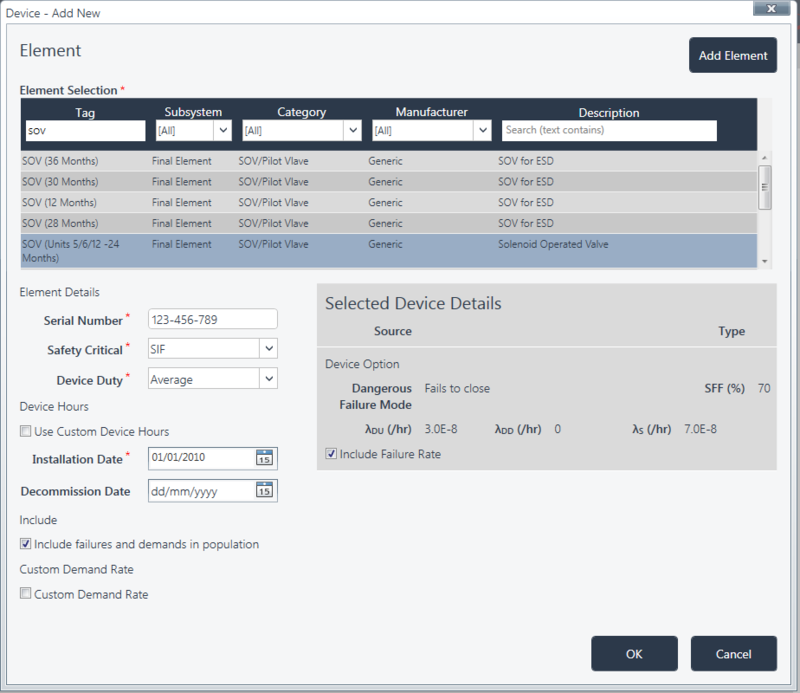 Configured Devices will appear in the DATA Comp overview page and will be grouped to form populations of similar Devices. Analysis of Failures can then be made against the larger population of similar Devices. Note: Demands are analysed per Device. Analysis is also performed on the Failures of each Device. See Demands and Failures and Analysis for more details. Edit – Edit the selected Device. Load – Add Failures and/or Demands to the Device and view the analysis for this Device. Delete – Delete the Device and all of its contents.